Two years ago, as we settled into our new place, I started the hunt to find a table that would fit our family and allow space for others. We had outgrown our old one, as our crew climbed to six members. With more room to now hold a big farmish - style table, I set to work finding one that would work in our budget and space. Finding a used one was a must or building it myself, as spending a small fortune on a table that was going to be surrounded with toddlers was just plain silly seeing markers and toys and scratches are just part of the day to day. I did not need another thing to steal my joy about as it got loved on a little too hard by small hands. I found one on Craigslist and sent an email to the seller who had assured me it was grey. My husband, along with a sweet friend, picked it up together since it was so large. Purchase was on contingency: as long as it looks good. They brought it home; sizing was perfect, only to find out the color was purple, not grey. It had great bones, so we kept it. 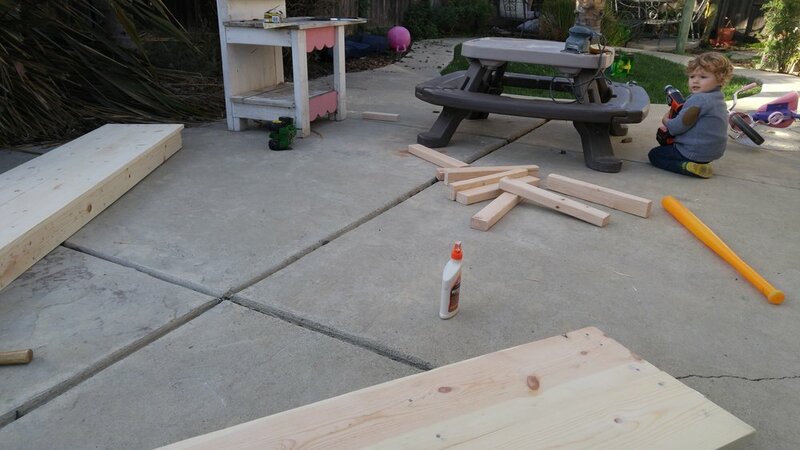 My mom and I painstakingly went to work; sanding down what turned out to be about ten coats of thick, purple paint. As the coats of paint came off, blemishes and imperfections that had been hidden were now in full view. Exposed. I was surprised and excited to see some of its history being uncovered; the herringbone pattern that lay beneath, marked with dents and crevices. Some were so deep the paint kept them filled to keep them flush with the table top and others were lifted with a bit more sanding. As this processes unfolded, the Lord started speaking about those who would gather around our table, no one coming would be perfect - everyone has scars underneath. It was another reminder of the healing process, how it takes time and prayers for scars to be healed. Some go through life without healing their scars and come to table after table with their scars hidden under pretty smiles and clothing or in full view but not ready to take the time and effort it takes for the healing to restore them. The table is an intimate gathering of people. Sitting next to someone and sharing a meal. Have you ever had a dinner with someone you hardly knew? It can be uncomfortable at times because of its intimate setting; sitting across from someone, making eye contact, sometimes searching for conversation in the pauses. The table spans every race and color and gender and anything else that can separate because food is essential to live. It unites the human race. Everyone needs bread. Everyone needs the Bread of Life. As we sanded and stained and primed and painted, I prayed over the table. For the people who would gather around and share meals with us. For our family and friends and extended loved ones and those we had yet to meet and those who had previously called the table theirs. The table came together, by God's grace better than anticipated and with more effort than I would have liked to have given; a hodgepodge of sorts just in time for hosting Thanksgiving that year, perfect for feasting weekly on Taco Tuesday and coloring and playing board games and all the in between. And built benches to match but that is another story. Praying that as you gather together to celebrate Thanksgiving this month that you would take advantage of the opportunity to invite others to your table, really inviting people in. Praying that you wherever you find yourself, that you would be open to hearing and listening and focusing less on the preparations and decorations of the feast and more on your heart towards each of the guests around you. That your heart would be prayerfully prepared first and foremost before the turkey is ever put in the oven. Praying that you would see that the space you make at the table for others is more valuable than anything else you can offer. Originally posted in The Inspire Monthly newsletter, November 2018. Join the adventure to be the first to get it straight to your inbox, along with other fun tidbits from the shop.